They speak to one another – Social Media and Brand YOU. If you think your brand irrelevant, then do a search now on Google. Or, better still, does it speak to your brand description [the best lawyer in the World or whatever you aspire to be]? Can you imagine a product that has invested a lifetime of outbound marketing not caring a jot about what others see? Not on your life. If I am honest, I am always surprised with the amount of material that a search throws up. Thankfully, social media done right, gives you the possibility of changing your positioning. Before you immerse yourself up to your neck in one social media platform after another you would be well advised to consider what message and or (personal) brand perception you are trying to convey. Of course, if there are other issues that make up your brand or you think you need to work on then write them down. The reason why you are forcing yourself to think in this way is to understand what you really should be focused on when it comes to social media. Not everything needs to be opened up to the world, whether that is the description you use on Twitter or the things you comment on in LinkedIn. Don’t misunderstand me, I am not suggesting you go for the faux version because you think that will win you more friends but rather you don’t have to share everything. The corollary of this is there may be things that you do want to share – blog posts, Slideshare presentations – that will be much more impactful on one plane than another. 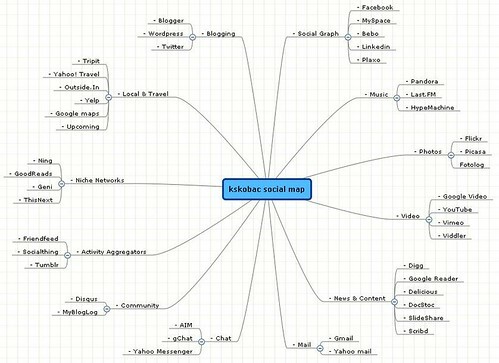 Another practical task that you need to undertake is to prepare a Mind Map of your social media activity. The idea of a Mind Map like this is to position yourself in the networks that you have chosen and then consider which aspects of your Brand YOU strategy are best suited to each platform. It stands to reason that something like LinkedIn is far more likely to open up opportunities for you to become a thought leader if you are spending meaningful time starting discussions or, better still, a WordPress blog. Whereas something like Twitter or Flickr will give you more personality in certain respects but could, if you are not careful, make the wrong impression. Don’t misunderstand me. I am not suggesting that you contrive things to the point where you eviscerate your true personality. I am simply suggesting that you marry your brand with your social media presence in a semi-organised way, rather than allowing the process to run itself. It is a good idea to keep checking in on your Google presence just to see how things may have changed. For me, I have gone through substantial change in my professional life, and although I am immensely proud of what I achieved in my former life as a lawyer, I am not sure that my presence should now been determined by material that does not necessarily represent who I am. One other tip, it is always a good idea to get a friendly third party to look at your various social media profiles for some honest feedback. If you are trying to position your brand in a certain way do your profiles speak to them? You might be wondering if this process is worth it. Let me assure that in a crowded market being distinct is essential. If your persona is like the rest of the World then you are limiting the opportunties available to you. The key point is that if you don’t brand yourself then someone else will do.